LAGUNA HILLS, Calif. (BRAIN) — Bicycle Retailer is looking for retailer feedback for an editorial package slated for our June 15 issue. We're taking a deep look at the bike retail compensation landscape, how it's changing and how a proposed higher federal hourly wage might affect small businesses. LONGMONT, Colo. (BRAIN) — Retailers Rick and Jill Emerson, who own Bike-n-Hike in Longmont, are welcoming Colorado's spring season with open arms this year. As recipients of BRAIN's second Retail Remodel Project, the Emersons are already seeing positive results all around. LAGUNA HILLS, Calif. (BRAIN) — Bicycle Retailer & Industry News is looking for new product information and news to include in its annual Sea Otter Festival & Gear Guide that will be handed out at the four-day festival in April and distributed to retailers and BRAIN’s subscriber base before the event. LONGMONT, Colo. (BRAIN) — The planning phase of Bicycle Retailer's second Retail Remodel Project is well underway at Bike-n-Hike in Longmont. LAGUNA HILLS, Calif. (BRAIN) — Bicycle Retailer has selected Bike-n-Hike of Longmont, Colorado, for its 2016 Retail Remodel Project. New BRAIN issue looks at growth in retail chains nationally, the NBDA's list of America's Best Bike Shops, a Florida retailer's lawsuit against Giant, and more. LAGUNA HILLS, Calif. (BRAIN) — Some of the biggest bike retailers in the U.S. are getting bigger, adding new locations even as the number of bike shops in the country is on a steady decline. Retailers being asked for feedback on the Industry Directory, a project of BRAIN and PeopleForBikes. 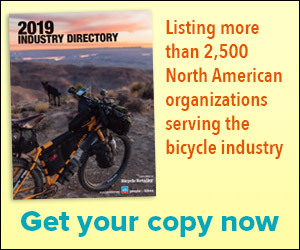 LAGUNA HILLS, Calif. (BRAIN) — Bicycle Retailer & Industry News and PeopleForBikes are again partnering to update and publish the annual Industry Directory. LAGUNA HILLS, Calif. (BRAIN) — Bicycle Retailer & Industry News' lastest print issue, the July 15 edition, features coverage of the retail scene in Vancouver, where recent improvements to cycling infrastructure are leading to growth in bike sales. LAGUNA HILLS, Calif. (BRAIN) — Bicycle Retailer and Industry News is looking for retailers to participate in our 2015-2016 State of Retail panel.